If you know me, you know I have a love for all things dragon. So much so that I have two tribal-style dragon tattoos. So since tomorrow, the real Valentine's Day, is pretty full of class, and Chris leaving in the afternoon to travel for a work conference, we decided to celebrate the day on Saturday. So we had a tasty breakfast and plan on going to dinner and a movie later today. And in the in-between we swapped gifts. 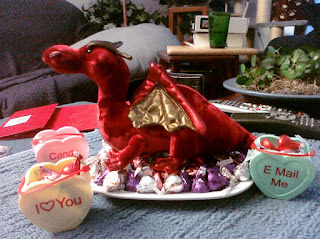 Since Chris knows me - he knows I like chocolate, gadgets, and dragons. All of which were present. He got me a keyboard the snaps onto the PS3 controller (which will be fun to test in a little bit after its done charging), some chocolates, and this adorable red dragon. Looking forward to enjoying a movie and a tasty dinner out.